A raw food diet can be the perfect way to pamper your feline companion while also giving them some great nutritional benefits. We’ve researched and reviewed some of the best raw natural cat food options out there to help you give your cat a taste of the wild side! First, take a peek at these features to consider when choosing a new cat food. Food Type - Dry, wet, and freeze-dried food made to be rehydrated are the main types of raw cat food options you’ll see. Cat Age - Some raw cat foods are designed for adult cats, while others can also be used for kittens and senior cats. Package Size - Trying to get the best value? Pay attention to the package sizing choices as a way to compare prices. Dehydrated -Dehydrating uses more heat than freeze-drying, which may affect the flavors and nutrients in the cat food. Main Protein - Where’s the beef? Actually, there are tons of main proteins in raw cat foods beyond the typical beef and chicken! Made In - Where is it made? We prefer pet foods made in the USA, since quality control tends to be more strict. Do you have your cat with you to help you decide? Good. Our top pick and budget pick are our overall favorite options for the best cat food for feeding a raw diet, but we didn’t stop there! Read our full cat food reviews to totally compare your options. 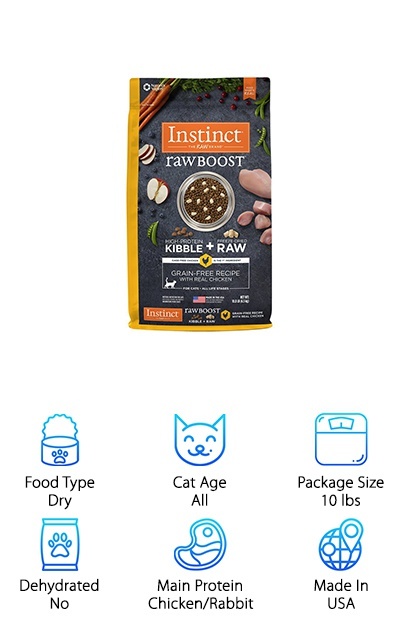 Our top pick for the best natural cat food for a raw diet is the Nature’s Variety Instinct Raw Boost Natural Dry Cat Food. This dry kibble is easy to feed with no rehydrating required. It’s actually a mix of traditional kibble and freeze-dried raw pieces. Choose from flavors and protein sources like cage-free chicken, rabbit, and duck. Package sizes range from two pounds up to 11.3 pounds to suit a variety of budgets and feeding needs. With healthy supplements of probiotics, antioxidants, minerals, and more, this raw food is designed from top to bottom for your cat’s nutritional needs. Each recipe features ingredients like fish and a range of vegetables as sources for vital nutrients and vitamins. This kibble is free from animal by-products, grains, soy, and potatoes--no fillers! It’s a great choice for combining the benefits of raw cat food with the convenience of dry kibble. A raw natural cat food diet can be hard on the wallet, but you can supplement your cat’s regular kibble with a touch of tasty, freeze-dried raw deliciousness with nature’s Variety Instinct Mixers. The freeze-dried kibble bits come in chicken or rabbit recipes with cage-free chicken, farm-raised rabbit, pork, and more. Vegetables and fruits provide additional vitamins and nutrients to round out your cat’s diet. And it’s all free of grains, potatoes, corn, soy, and by-product meals. That means your cat is getting a high-quality protein source that’s free of fillers and additives! Freeze-drying the raw food ingredients helps to preserve the flavors and nutrients as well as extending the shelf life. You can also use these kibble bits as treats, but keep in mind it’s designed to be a supplement or intermittent food source. For a total raw food diet replacement, check out our other reviews! 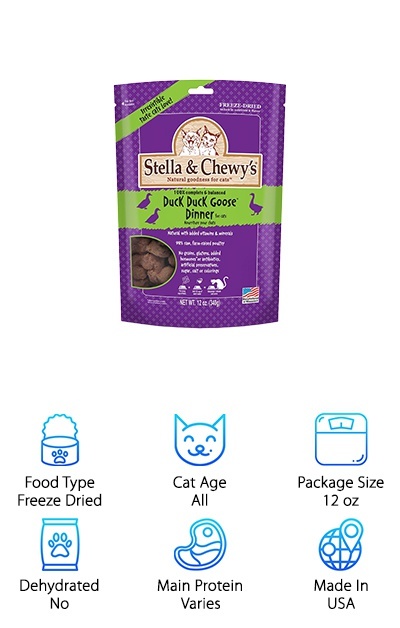 It’s easy to feed Stella & Chewy’s Freeze Dried Food as a treat or as part of a regular meal with the available packaging size range, from 3.5 ounces to 18 ounces. This high-protein cat food provides a complete nutritional balance and can be used for kittens and adult cats. Each recipe contains a mix of protein sources like duck, chicken, turkey, herring, tuna, and salmon. Vitamin and nutrient supplements ensure your cat gets a balanced diet. If you’re looking for a raw cat food with minimal processing that’s also sustainably sourced, Stella & Chewy’s fits the bill! All poultry is cage-free and other ingredients are organic. Plus, you won’t find any gluten or grains on the ingredients list. Every recipe is 98% meat, organs, and bone, put together in a USA kitchen with no ingredients sourced from China. It’s a convenient feeding option that stays true to the beliefs behind feeding a raw diet! Choose from rabbit, quail, or chicken formulas of the Wysong Archetype Raw Diet for felines and canines. This product is freeze-dried with a True Non-Thermal method to protect the nutritional content of the diet. It’s starch-free with no fillers, just shredded or chunked meat and nutritional supplements. These supplements include plant nutrients, prebiotics, probiotics, vitamins, and minerals mixed in small amounts as a powder with shredded meats to provide your cat with full and balanced nutrition. 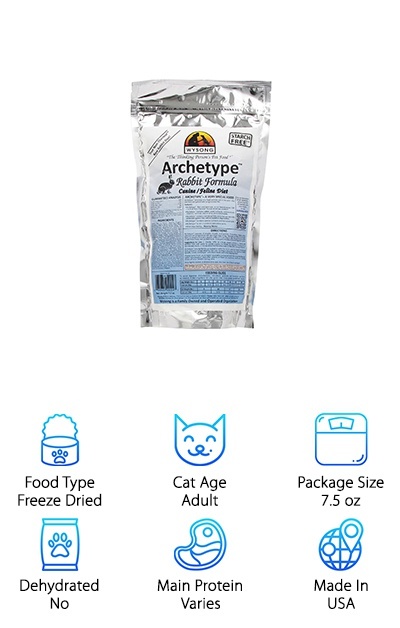 The Wysong Archetype freeze-dried food is chock-full of natural protein and fat. The low-temperature freeze drying method makes this raw food incredibly authentic to what cats would eat in the wild. There are no preservatives, artificial colors, or artificial flavors, either! 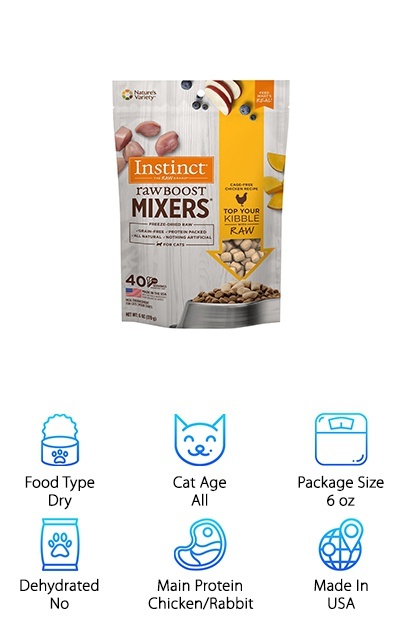 This is definitely one of the best raw cat food options for people who want to give their favorite feline a meal that is authentic to their inner wildcat. Available in flavors like carrots, tuna and turkey; chicken, carrots, and chicken liver; pumpkin, beef and salmon; and more, you have a variety of delicious wet cat food recipes at your fingertips! This grain-free healthy cat food contains shredded pure proteins and vegetables in a chicken broth gravy. It fulfills all of your cat’s dietary needs and probably tastes amazing! The individual-serve three-ounce cups come in 24-packs for your convenience. Unopened cups can be stored at room temperature. Wet food is ideal for cats since they tend to avoid drinking the standing water in their dish, and can help keep them hydrated. 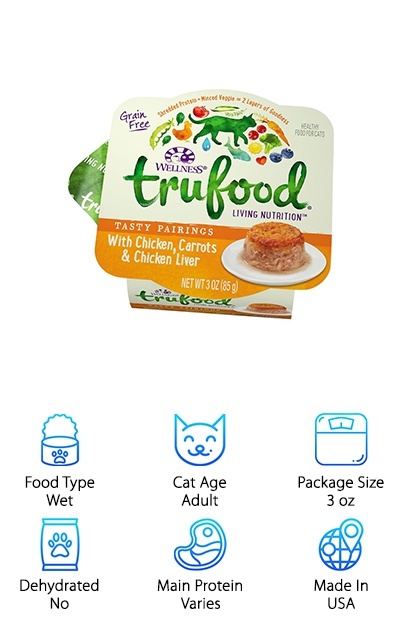 You can mix or alternate this wet raw food with the Wellness TruFood Baked Blends for even more texture and variety. Easy to digest and easy to serve, this all-inclusive raw food is a lot easier than cooking something up fresh yourself! Looking for a tasty raw meat treat for your favorite feline? How about duck hearts! 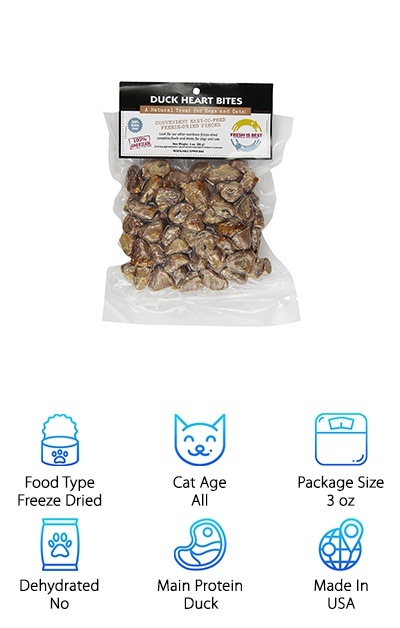 Use these freeze-dried whole raw duck hearts as a treat or supplement to their regular feeding. They are made from 100% USDA-approved duck hearts. Use them as a training treat or as an emergency meal replacement. The bag is resealable to help preserve the freshness, and these treats are suitable for both dogs and cats. Does your cat get finicky about their kibble every once in awhile? Slice up a freeze-dried duck heart and stir it into their meal to boost its appeal. You can reconstitute them in water for a soft and meaty texture, or dole them out still in their freeze-dried state, so they’ll last longer. Keep in mind some cats will try to swallow them whole, so watch out for a choking hazard. They’re a great way to occupy your cat and keep them out of trouble for a little while! The Primal Freeze-Dried Feline Formula brings the call of the wild into your cat’s home with a mix of chicken and salmon protein sources. Made in the USA, this freeze-dried raw food for cats of all ages provides a ton of protein as well as a mix of fruits and vegetables to provide natural sources of fiber, vitamins, and minerals. It’s grain-free and soy-free, which is especially good if your cat has a sensitivity to those ingredients. Fresh ground bone helps to provide calcium, and organic natural sources of vitamins and proteins are easy to digest. This raw food contains ingredients sourced only from the USA or New Zealand, so you can be sure that they stand up to high quality standards. If you want to switch it up, try out the turkey formula or the beef and salmon formula! Don’t want to make your cat eat their vegetables? Then how about a freeze dried raw cat food that’s 98% meat? 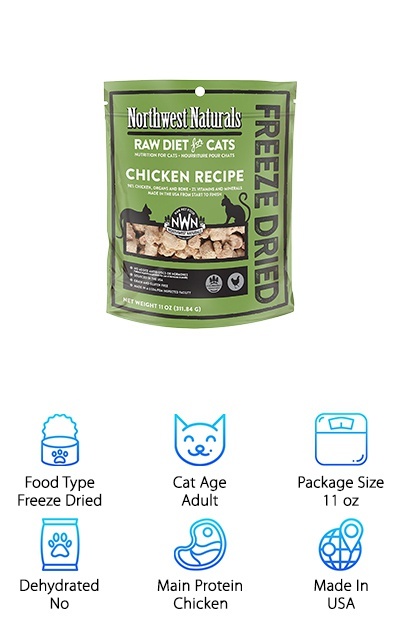 The Northwest Naturals Raw Diet Chicken Recipe contains tons of chicken muscle and organ meats with 2% vitamins and minerals to ensure your cat gets all of its nutritional needs met. Freeze dried raw food is a great choice for feeding raw on the go or avoiding a packed freezer--plus, you’re not paying for the water! You can also find a turkey option if your cat is too good for chicken. 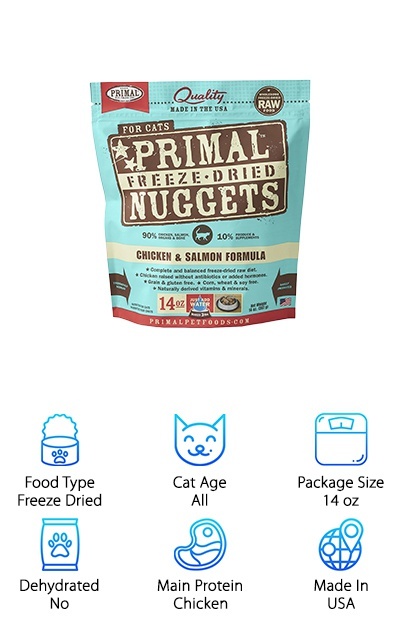 These freeze-dried nuggets are made from USDA-inspected and passed proteins in a facility with FDA and FSIS inspection oversight. This is an important aspect of raw food sources and helps to ensure you’re getting a high-quality product that follows food safety protocols. The end result? Your cat gets to eat a meal that’s almost as good as your own! 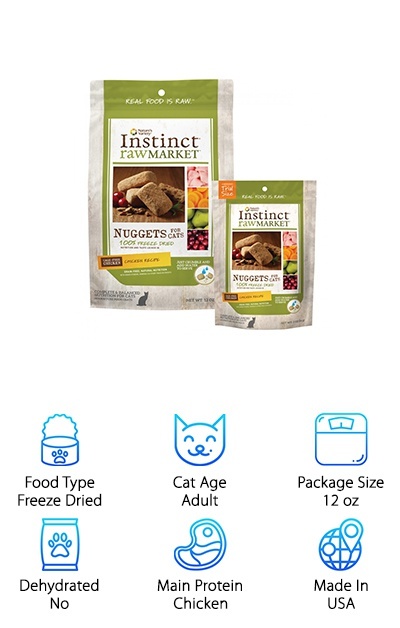 Combining the best of wet, dry, and raw foods, these freeze-dried nuggets are a great way to provide your feline with a raw food diet with a complete nutritional profile. Organic fruits and vegetables are combined with cage-free chicken, chicken liver, and chicken heart for tons of protein and vitamins. If you’re looking for an organic and cage-free choice for your next cat food, your search ends here! Rather than being dehydrated, these nuggets are freeze-dried to preserve nutrition and taste. This cat food is grain-free and gluten-free with a heavy emphasis on protein, plus a boost of salmon oil, vitamin E, and more. It’s easy to rehydrate and serve, and the nugget design makes this cat food simple to portion out depending on your cat’s size and activity level. Raw Market Nuggets makes raw food simple, providing a complete and balanced diet (or a healthy treat) for any cat. 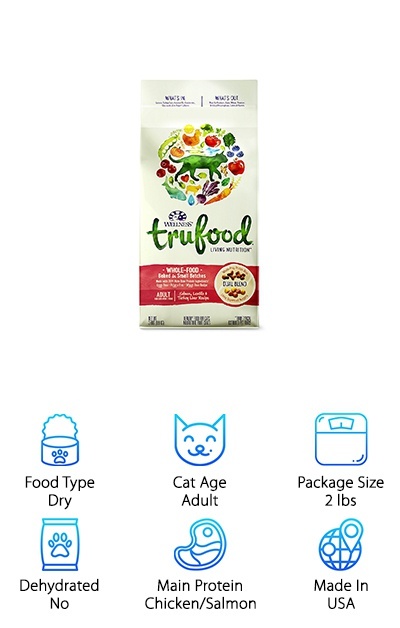 The Wellness TruFood Baked Blends come in varieties for kittens and adult cats and two different main protein options. One recipe features chicken and chicken liver, while another features salmon and turkey liver. The kibble uses only whole-prey sources with no animal by-products for the high-quality protein your cat deserves. Whole-prey bites are cut up and slow-baked with superfood nuggets that provide vitamins, nutrients, and probiotics. Plus, instead of grains (like wheat) or potatoes, this Wellness cat food uses legumes as a source of carbohydrates, fiber, and protein. If your cat has a sensitivity to corn or wheat, a holistic cat food is a great switch! This blend is a great choice for giving your indoor or outdoor cat the full nutrition they need with support to help keep them healthy. It’s easy to digest and provides a ton of protein!